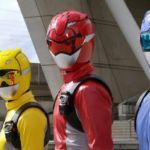 New Power-Up For Beast Morphers Red Ranger Sighted? Thanks to our friends over at The Power Scoop, new set photos were spotted online from the filming of the much anticipated Power Rangers Beast Morphers, the filming took place at Spark Arena New Zealand around December 12th 2018. 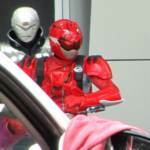 The photos show what looks to be Beast Morphers Red Ranger wearing a rather peculiar set of armor. For fans of the Super Sentai counterpart: Tokumei Sentai Go-Busters, you may know that the team acquires an upgrade called Powered Custom but the armor Red is using doesn’t appear to be Powered Custom at all but something else entirely. In addition, Beast Morpher Silver was also spotted on set. 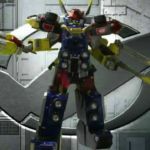 Unfortunately, not much else is known about this cool new upgrade but it is certainly exciting to see Power Rangers own original take on the Go-Busters power sets, something that the series hasn’t really done outside of Megazord cockpits in quite awhile. The convention artwork for this year’s Power Morphicon has been revealed on the Power Morphicon homepage. 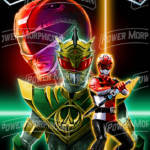 Featuring artwork by the famed Tsuyoshi Nonaka (Head Designer of PLEX for Bandai Japan and USA, designer of all the Power Rangers Legacy toys, designer of all Power Rangers toys in the 90’s), the Power Morphicon Convention Artwork features the Mighty Morphin Red Ranger, the evil Lord Drakkon, and the newest hero, the Beast Morpher Red Ranger. Check out the artwork and a shirt mock-up image by clicking the title of the story. Power Morphicon happens this August 17th-19th in Anaheim, California. It is the only official Power Rangers convention in the world and this year will help celebrate the 25th anniversary of the Power Rangers. Click here to start your registration process and we will see you at the show!